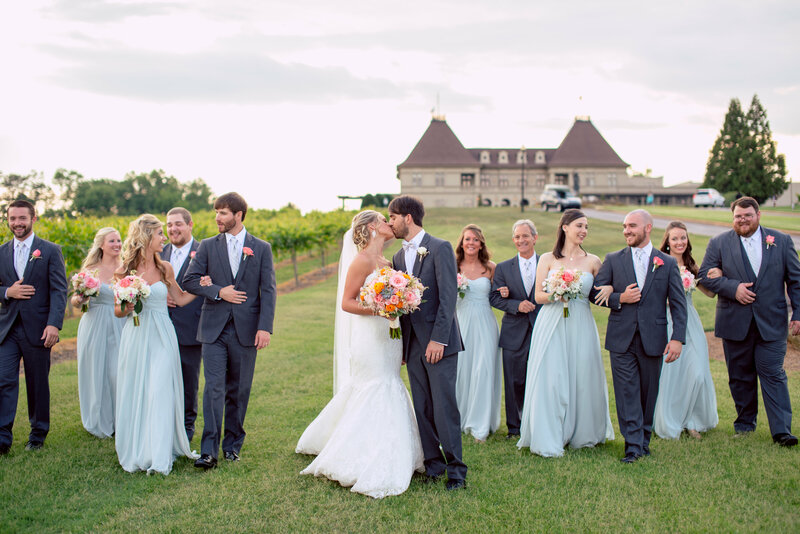 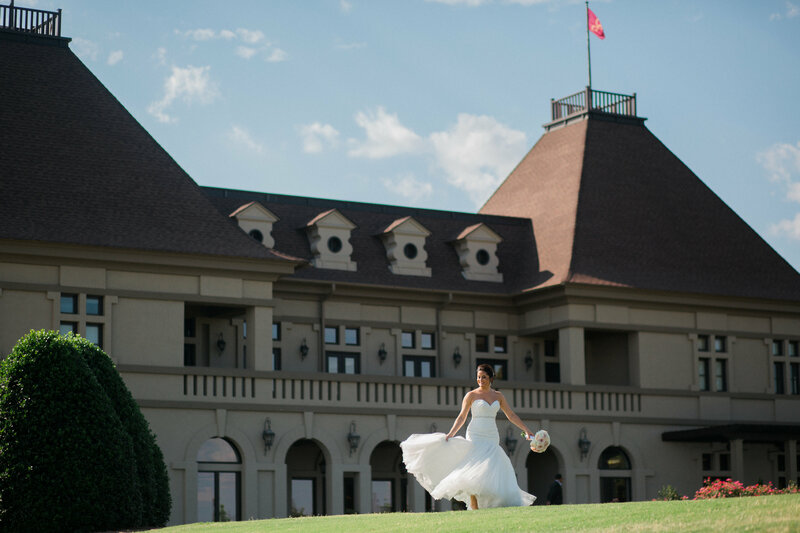 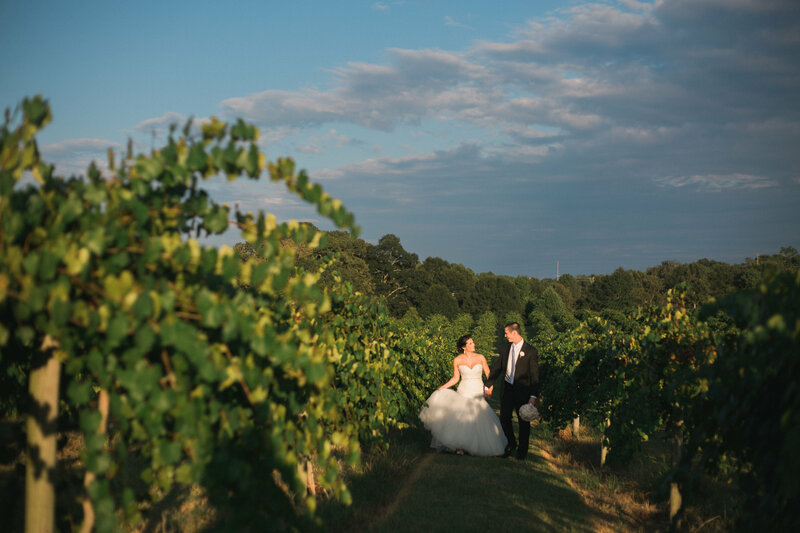 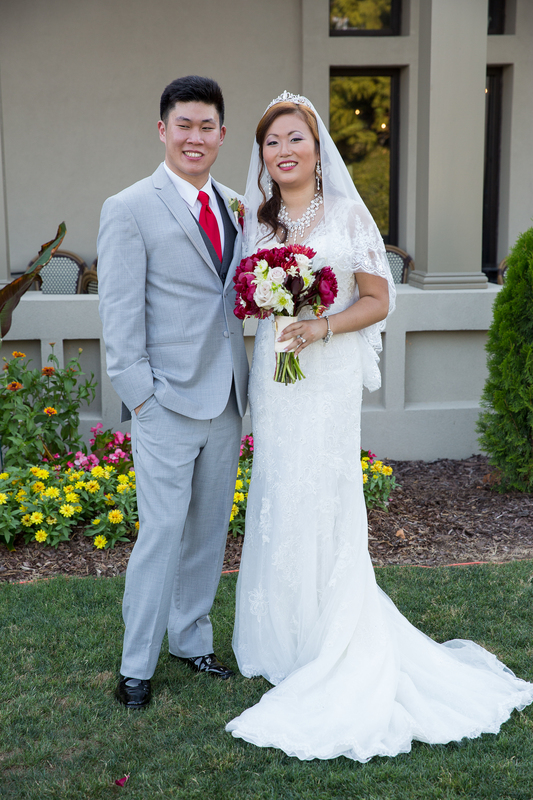 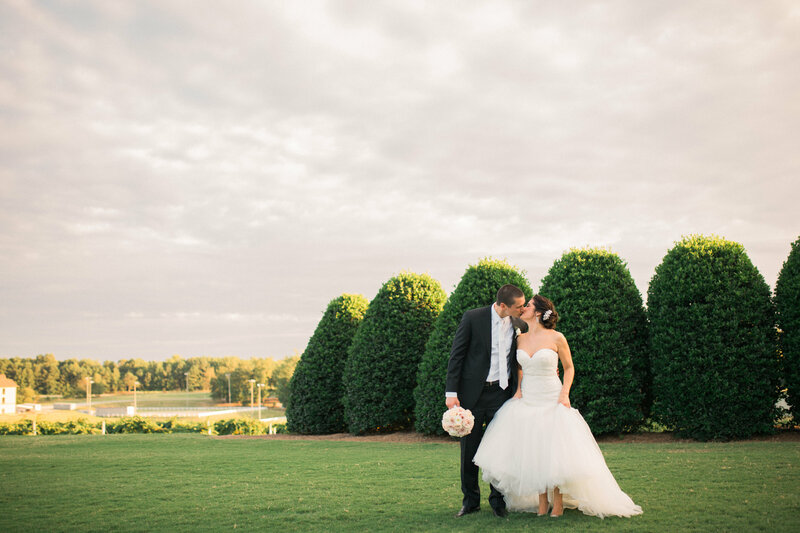 Yayu and Jerry were married outside at the spectacular Chateau Elan Winery & Resort. 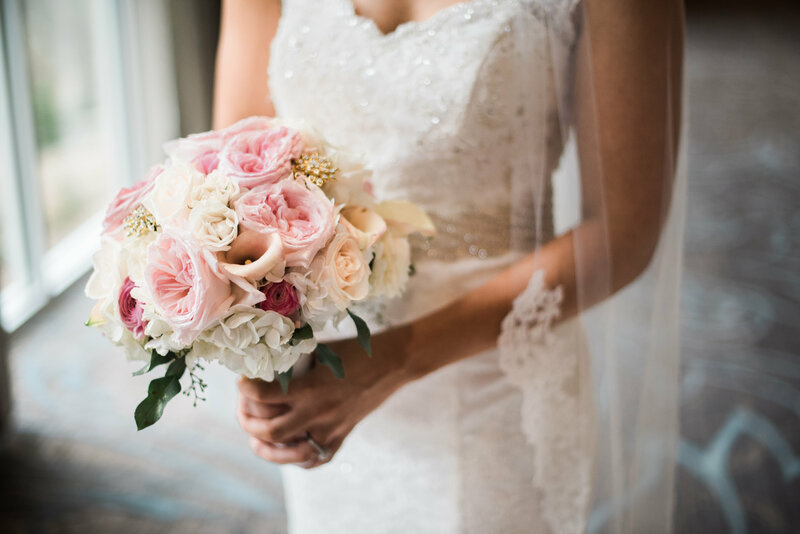 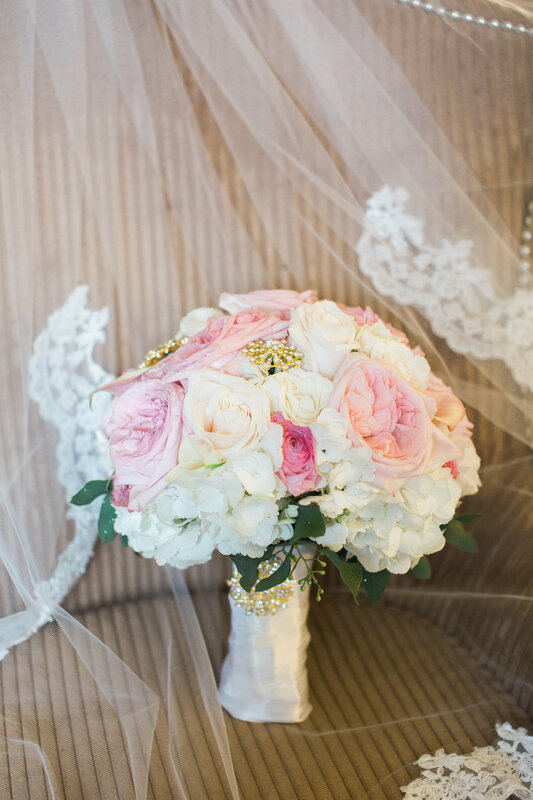 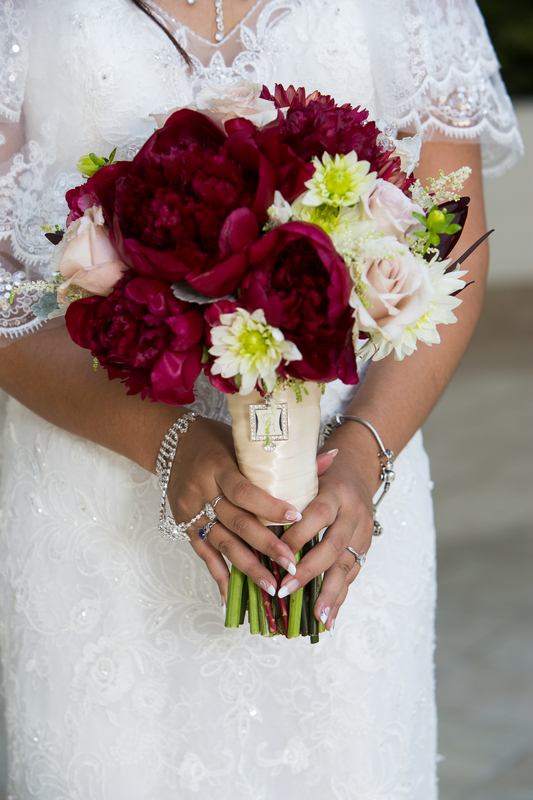 We designed Yayu’s elegant and lush bouquet with red peonies, burgundy dahlias, ivory dahlias, champagne roses, ivory calcynia and touches of dusty miller foliage. 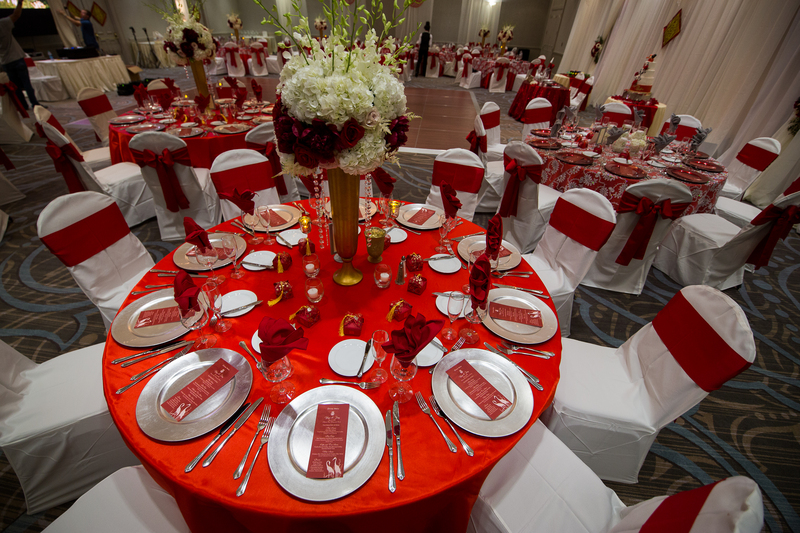 Design House created the “happiness emblem” with red petals for the ceremony. 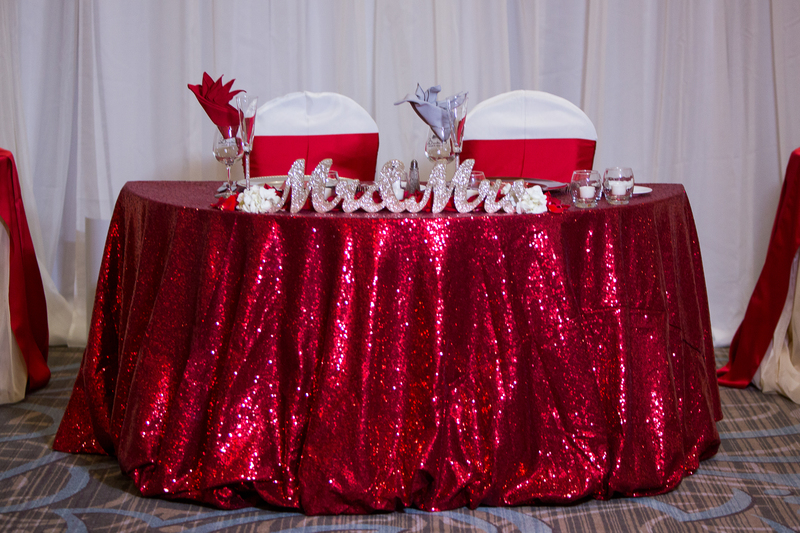 Two gorgeous aisle tables were also beautifully draped to display more burgundy stunning arrangements. 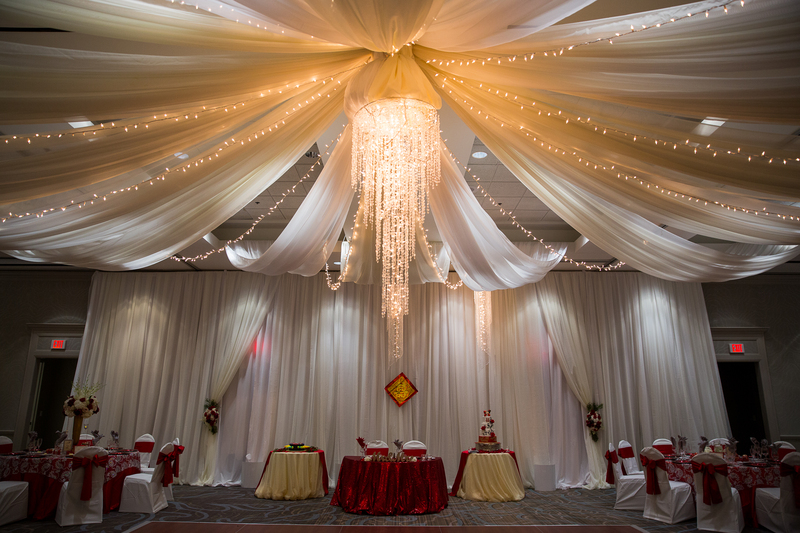 Designing an elegant ceremony altar is one of our specialties – – we designed a four piece canopy decorated with ivory fabric, a mix of elegant flowers across the top bar, heavy layers of hanging crystals on each side of the flowers with long hanging crystals on the back side. 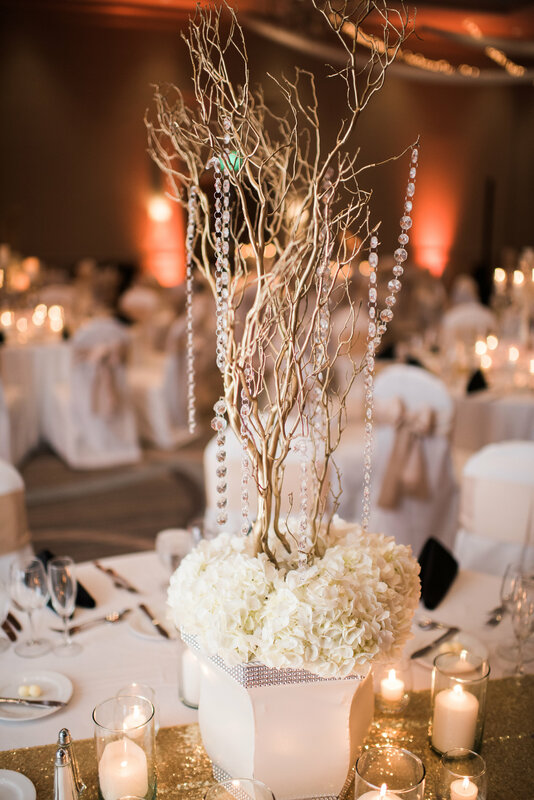 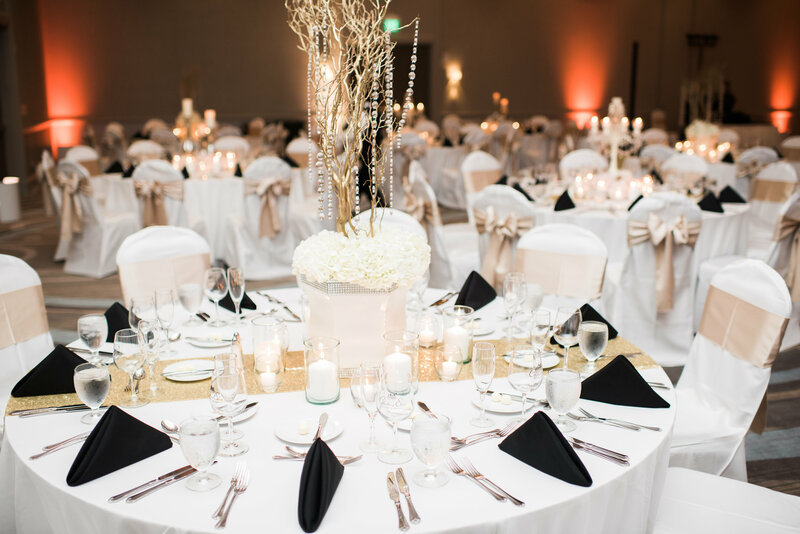 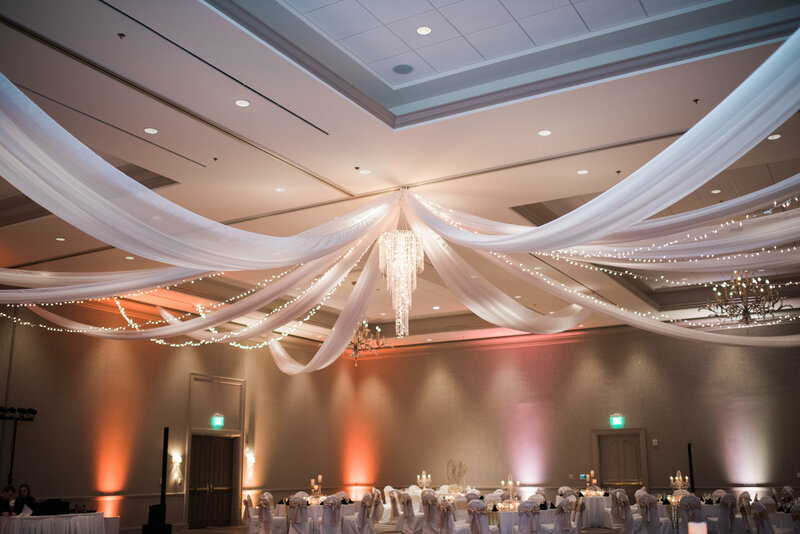 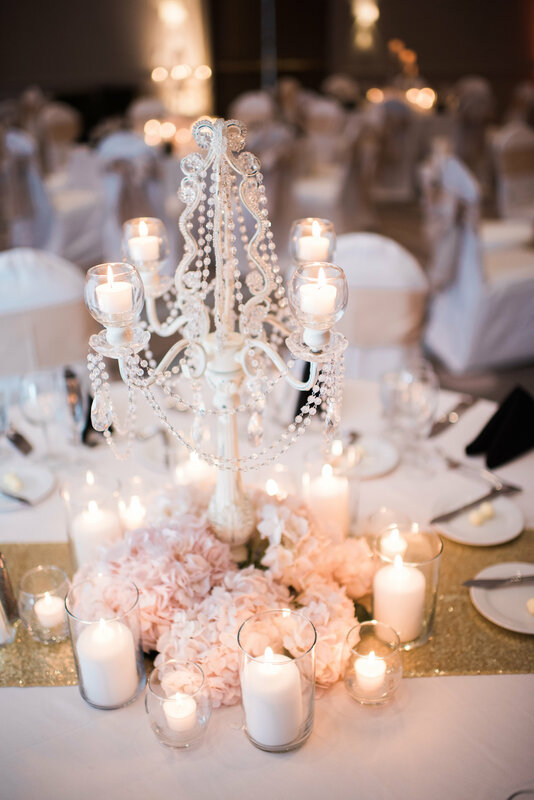 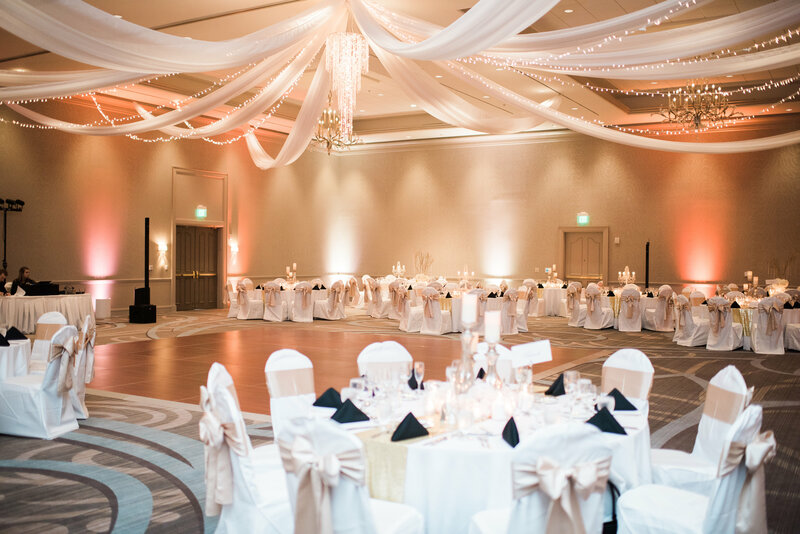 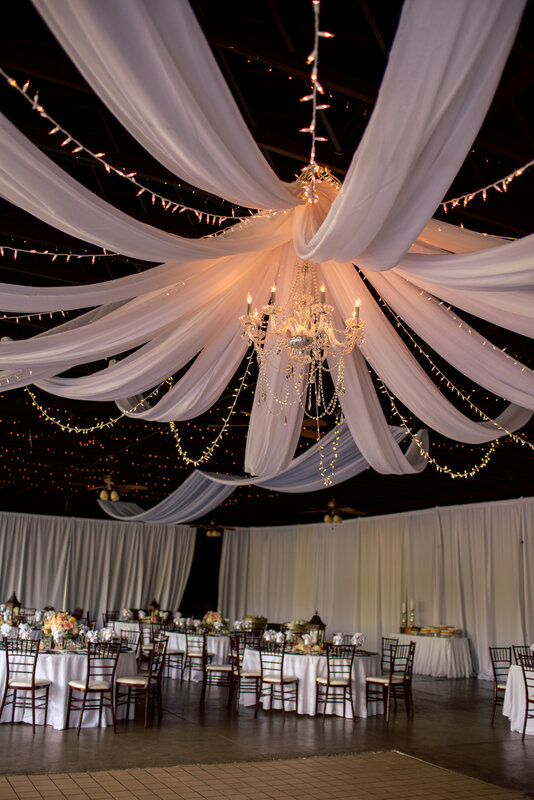 Red, Silver and Burgundy filled the Chateau Elan Ballroom with a magical crystal chandelier surrounded by more exquisite flowing ceiling draping. 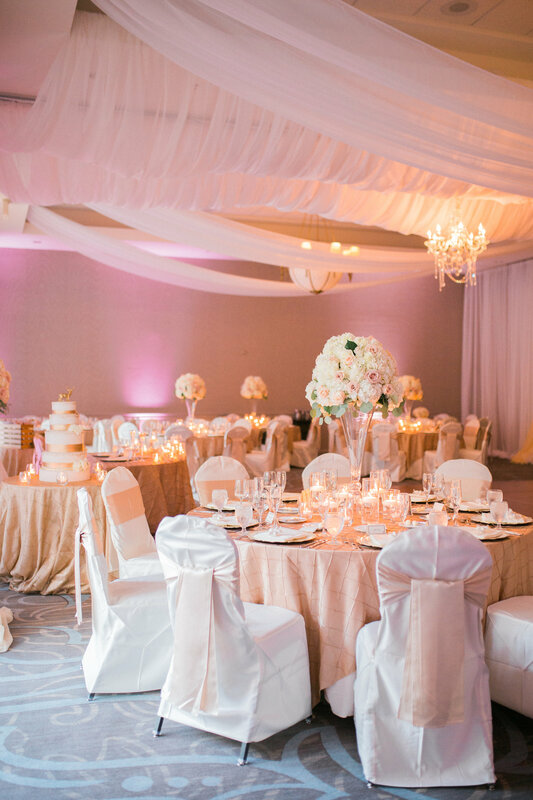 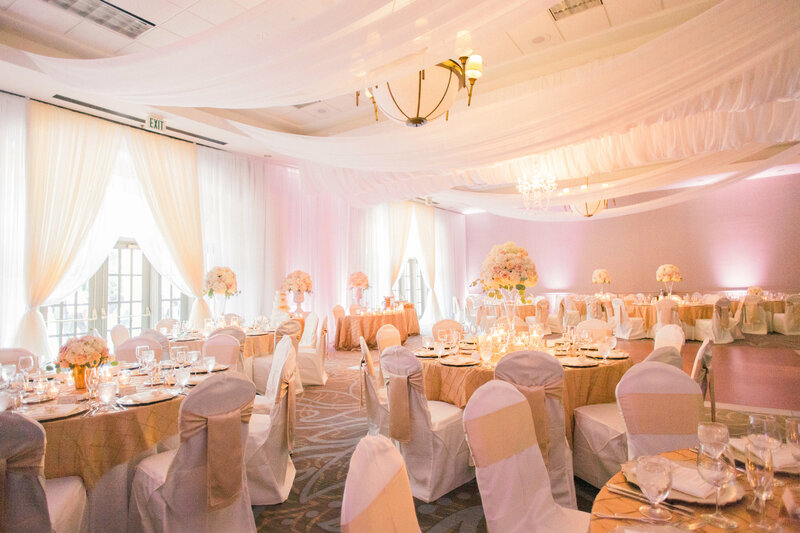 The view of the sweetheart table covered in a sparkling bright burgundy tablecloth was incredible as well with backdrop ivory draping highlighting this ballroom decor. 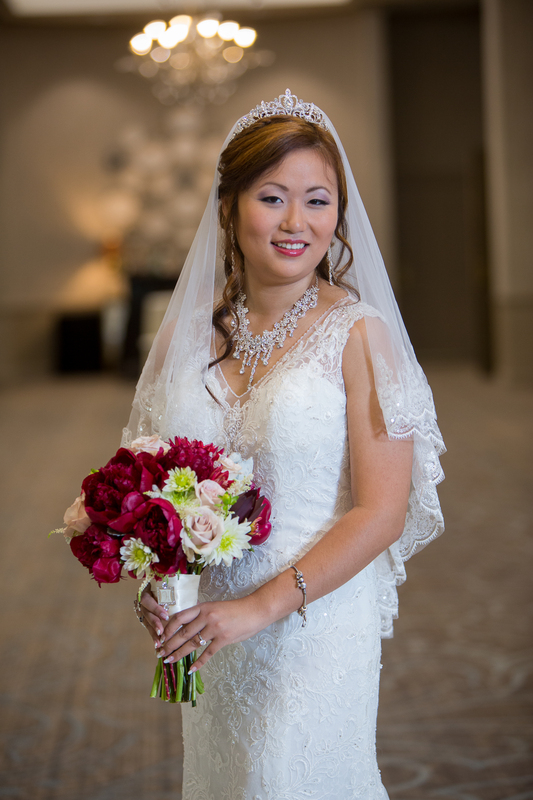 Thank you to Pixel This Photography for these amazing photos. 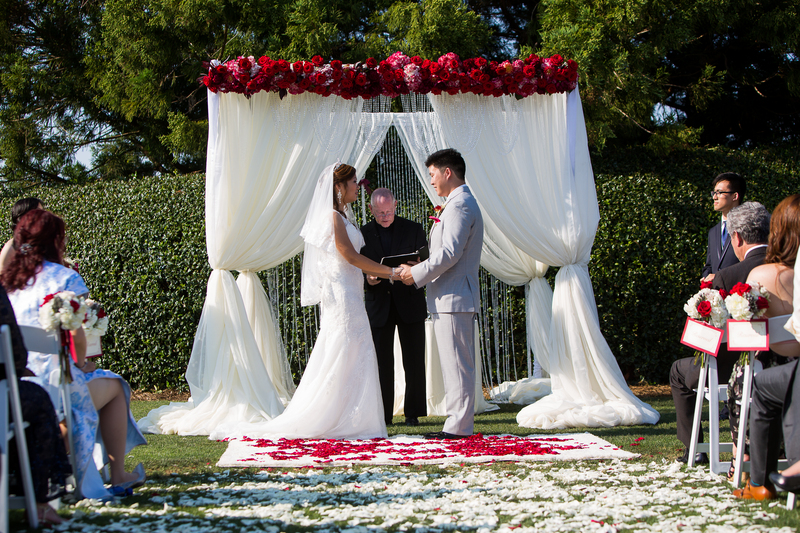 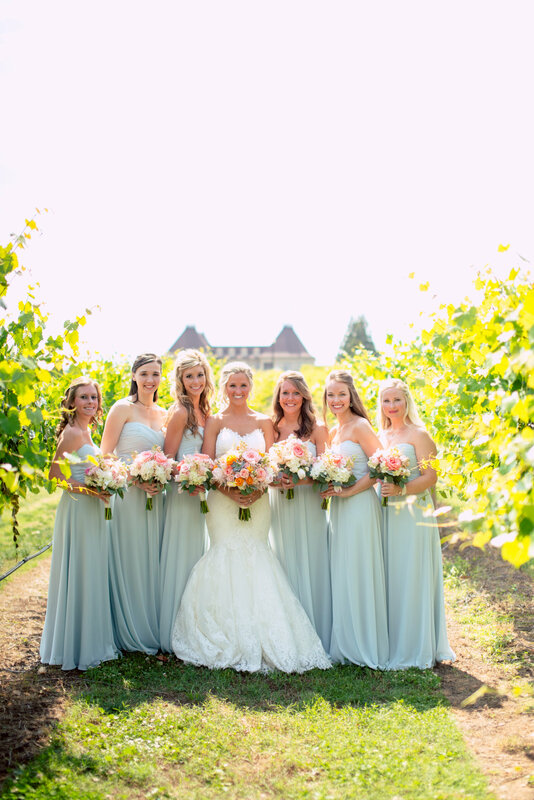 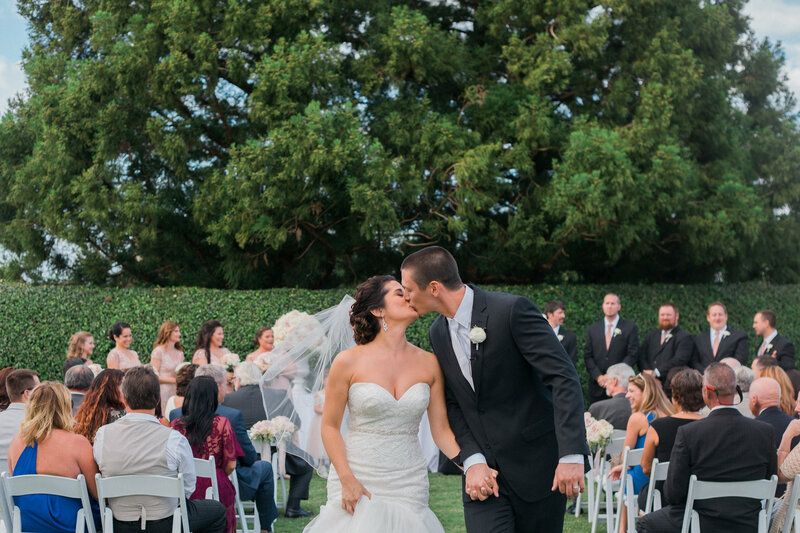 How do we describe this beautiful wedding? 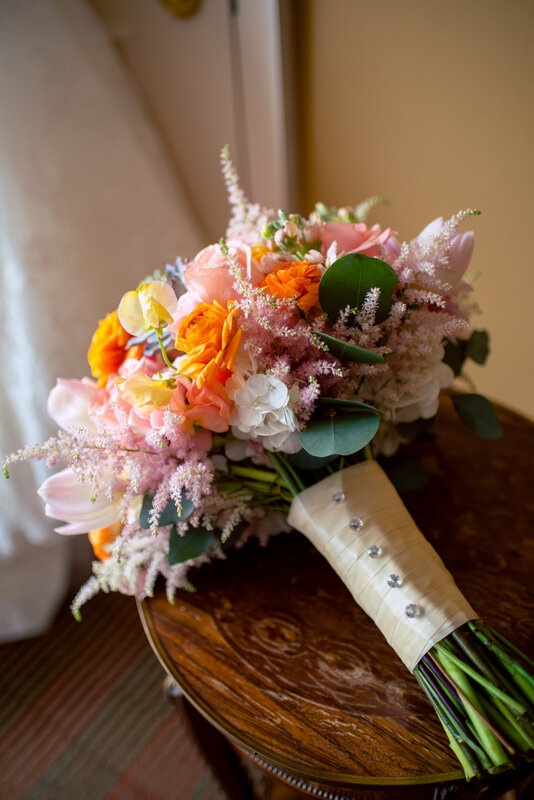 Peach..Pink..Green..Orange..Cherry Blossoms..Flowing Ivy..Elegant! 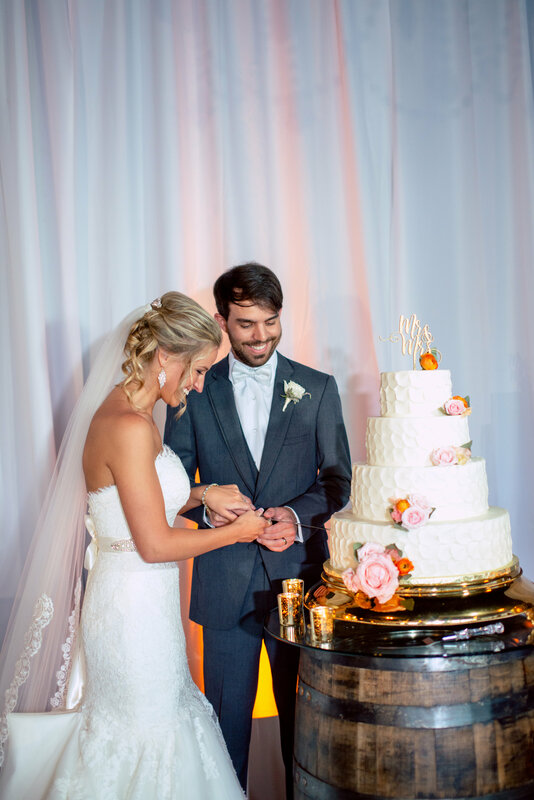 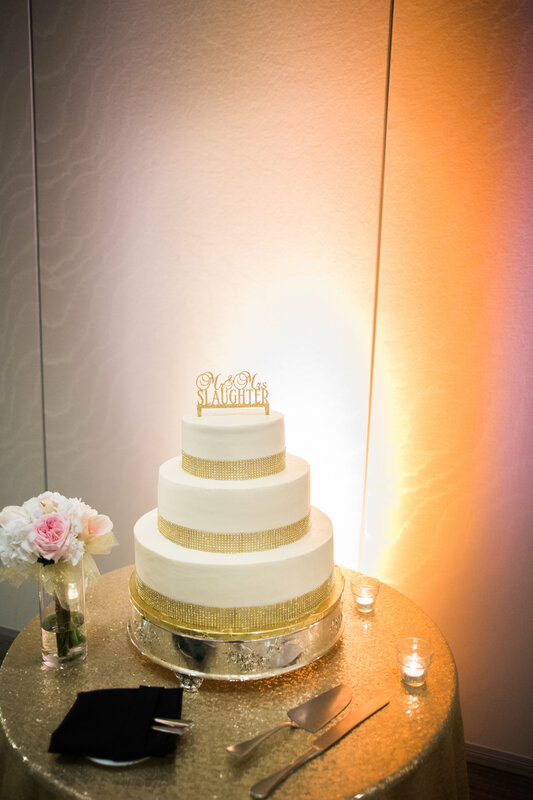 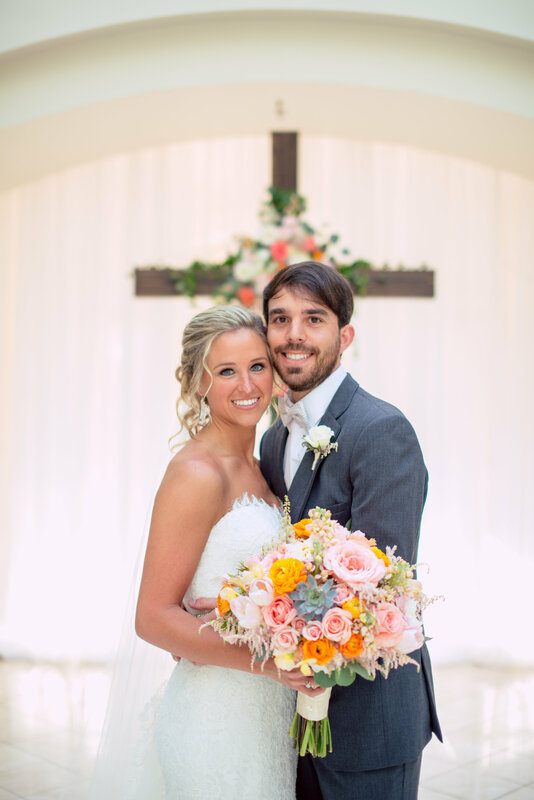 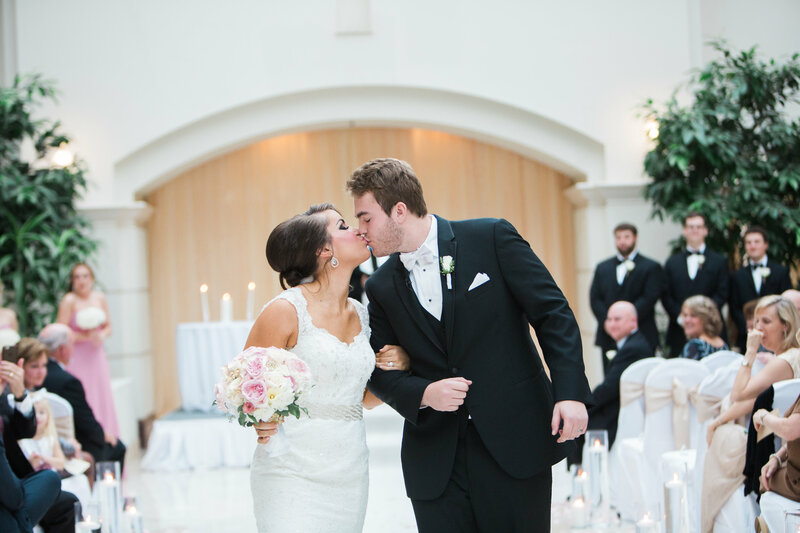 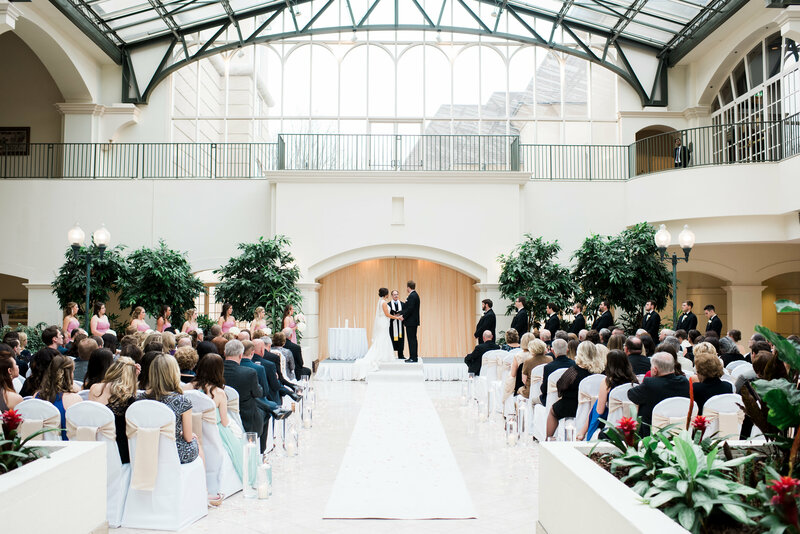 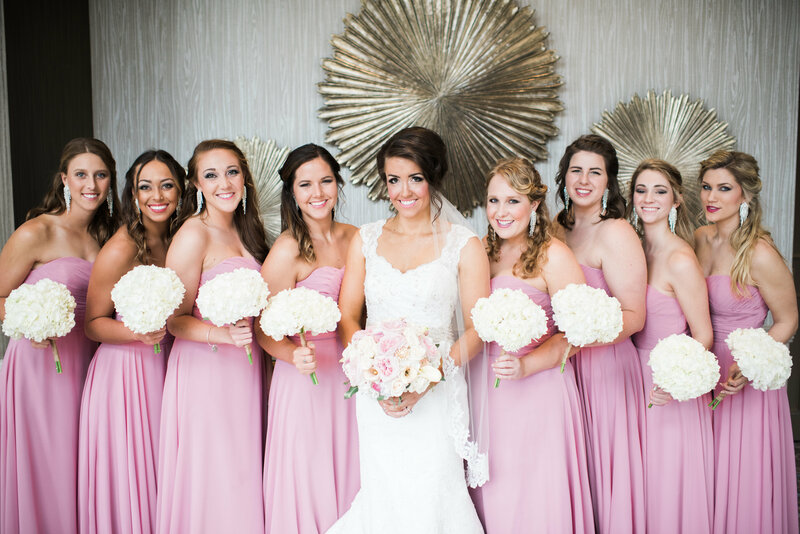 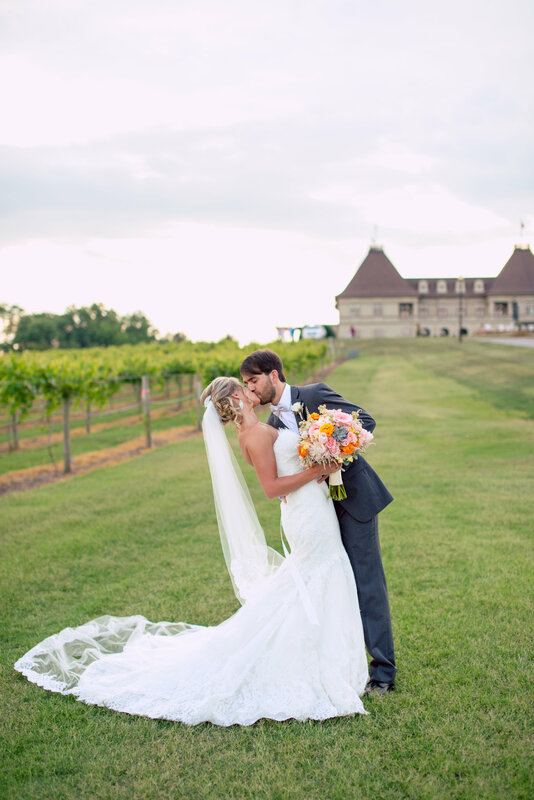 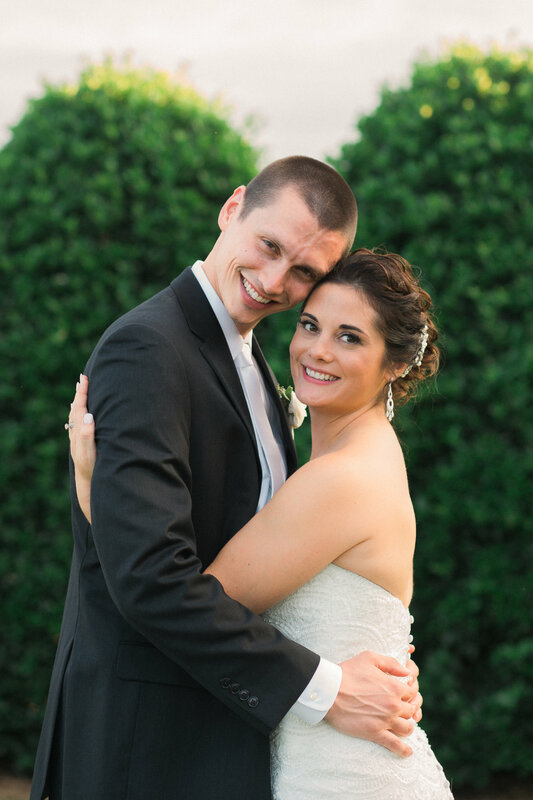 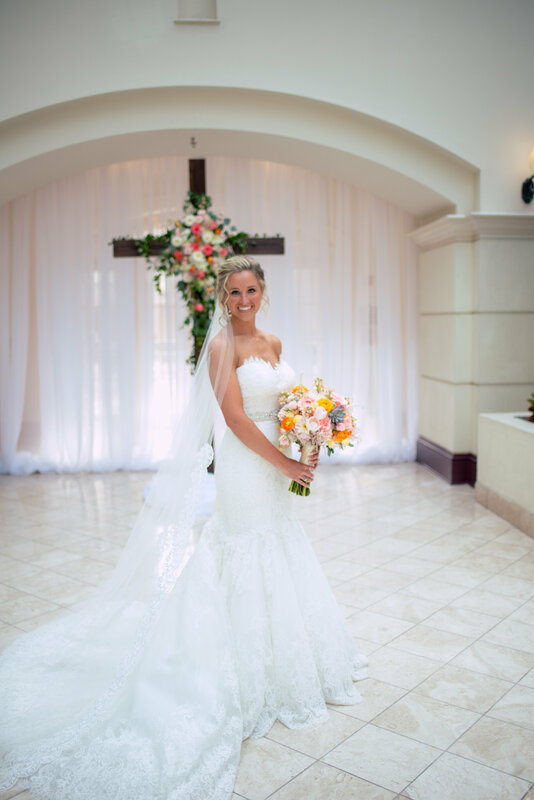 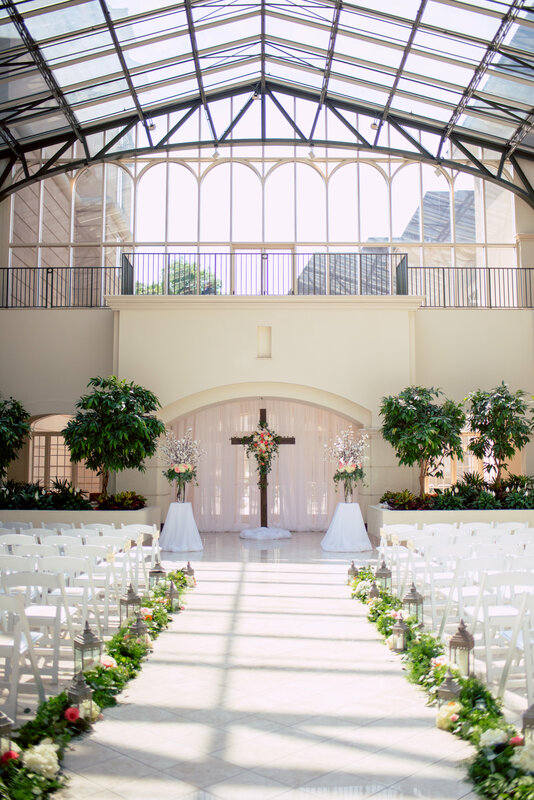 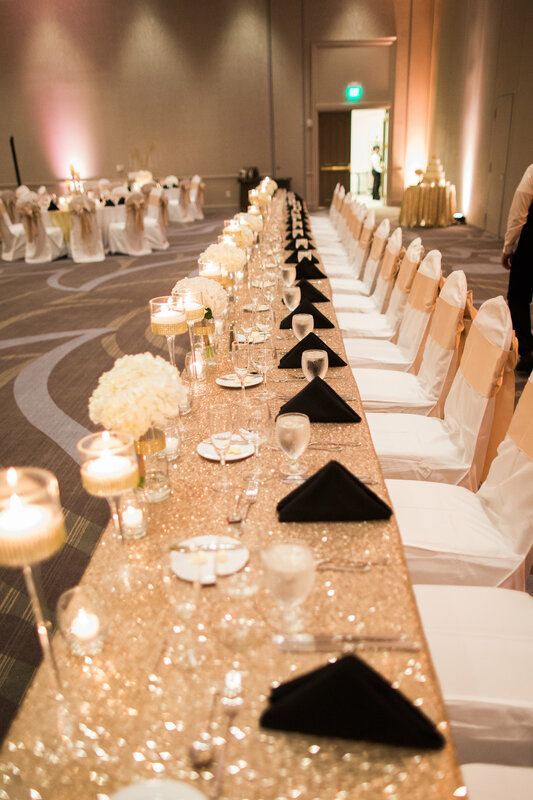 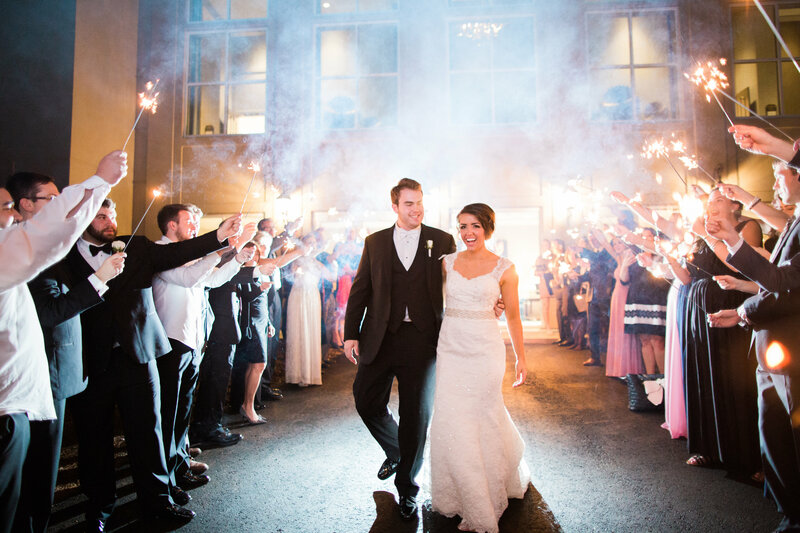 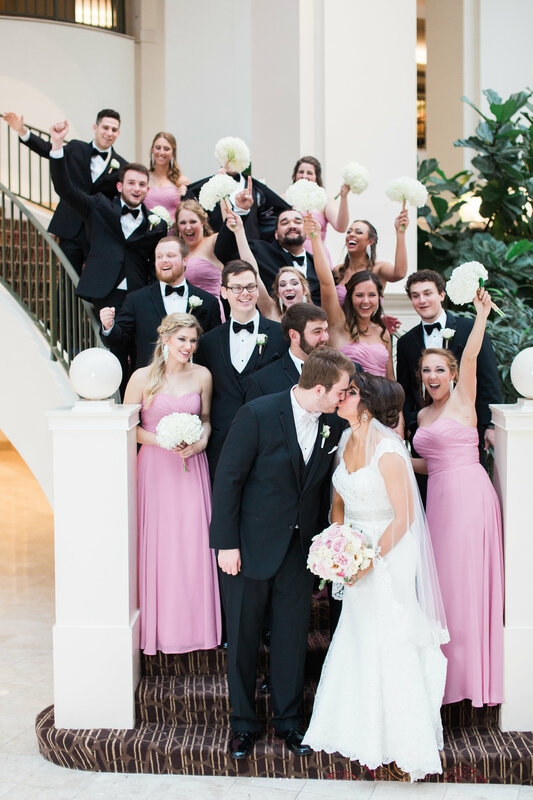 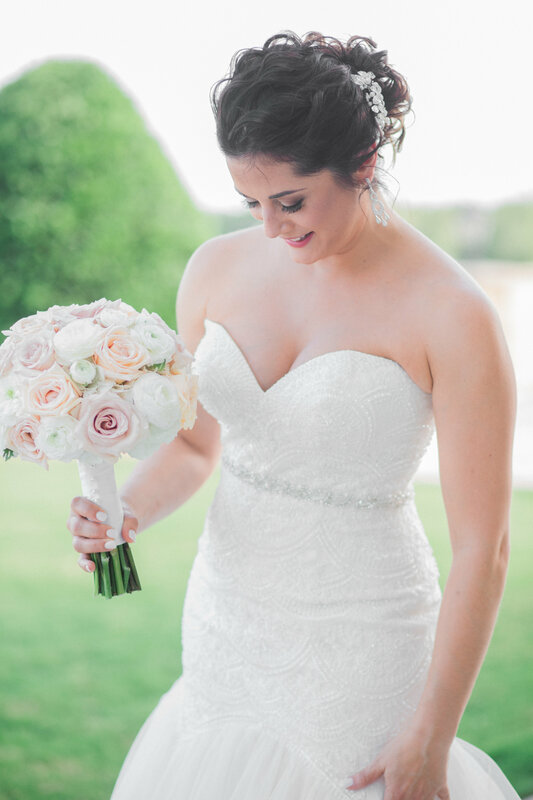 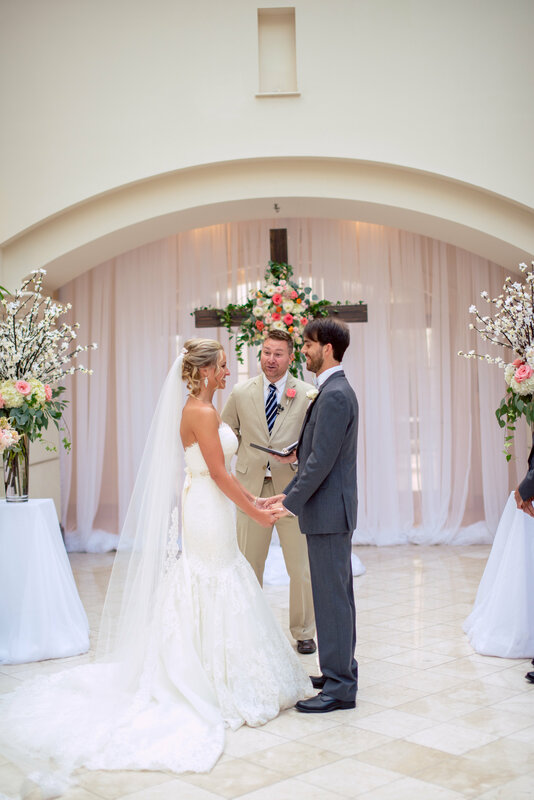 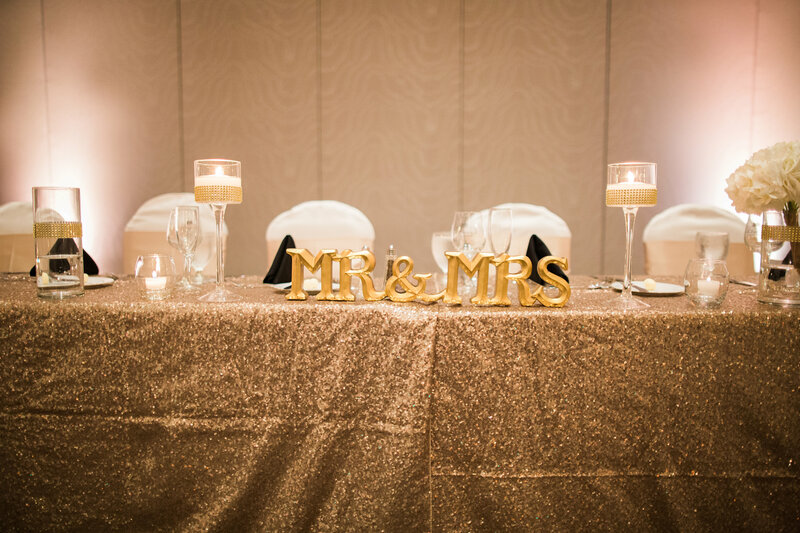 Kelli + Art were married at the Chateau Elan Atrium with their reception in the Winery Pavillon. 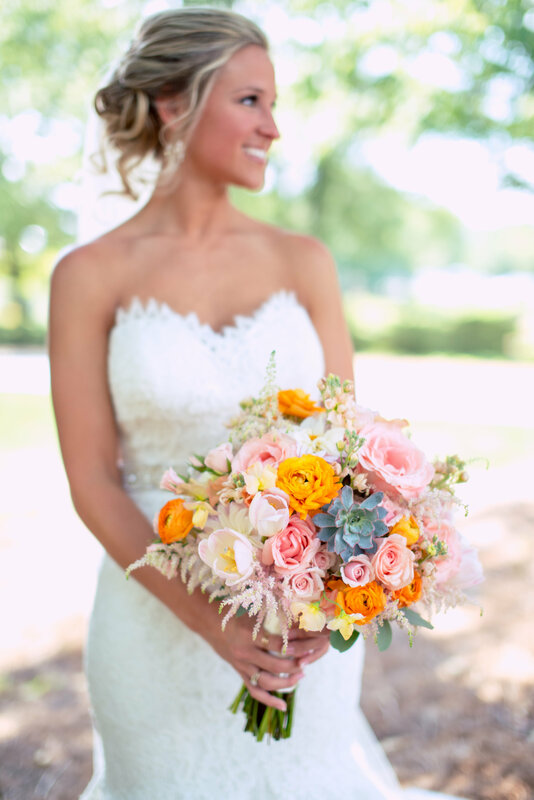 Kelli’s bridal bouquet was a full, textured, elegant bouquet designed with white hydrangeas, peachy orange roses, peach stock, pink spray roses, light orange ranunculus, peach dahlias, pink tulips, greenish gray succulents, light pink sweet pea and pink astilbe with a touch of seeded eucalyptus partially wrapped in ivory ribbon adorned with crystal pins. 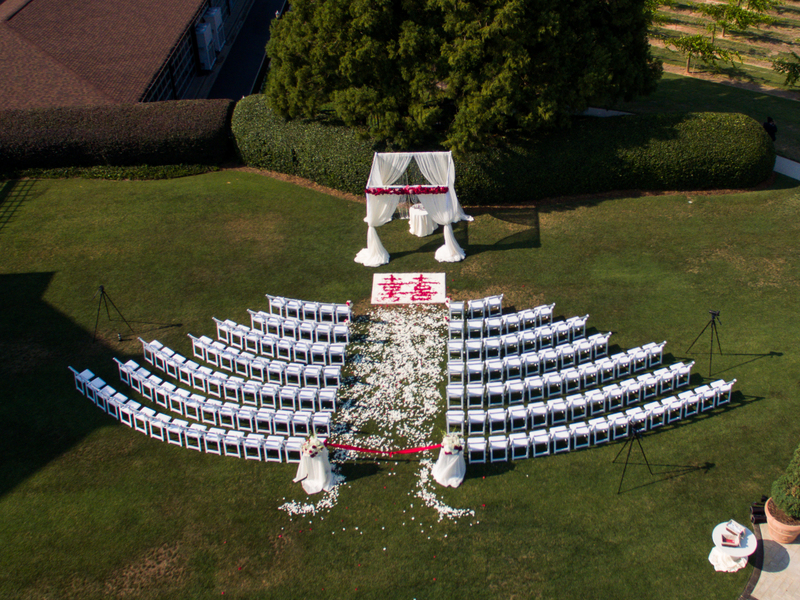 Now that’s a description! 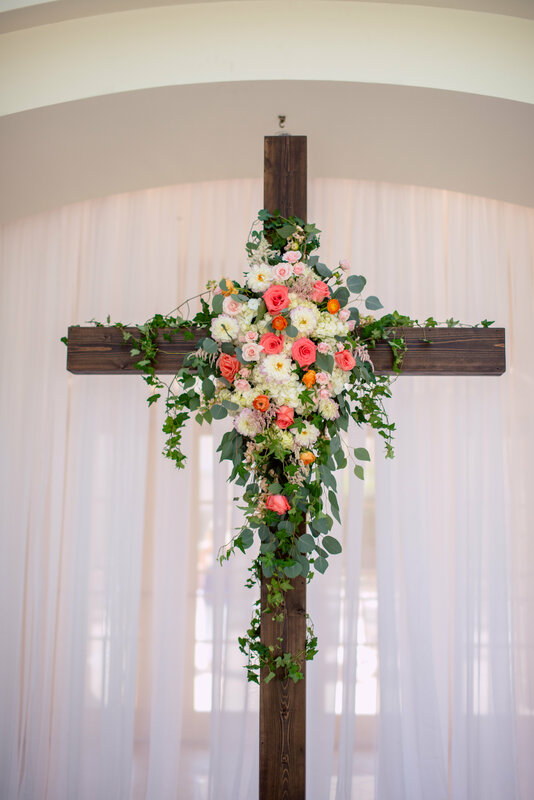 Kelli provided a wooden cross for the ceremony which we added a floral spray to the center to follow the cross. 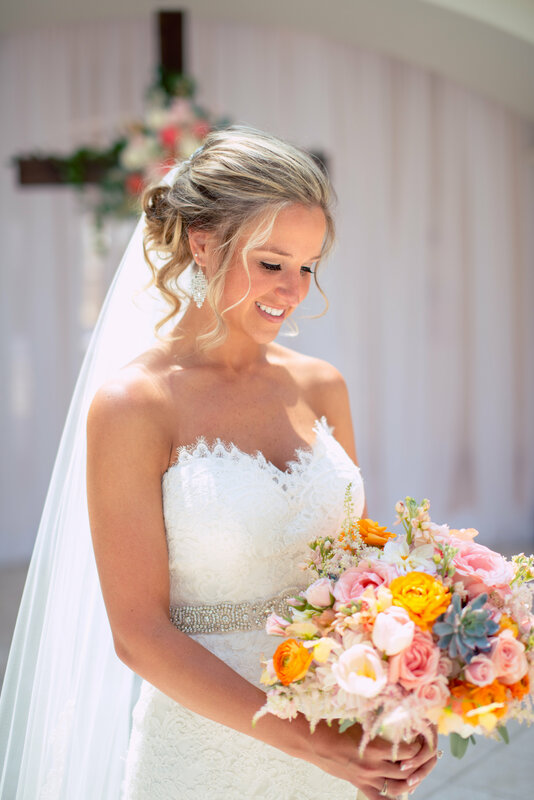 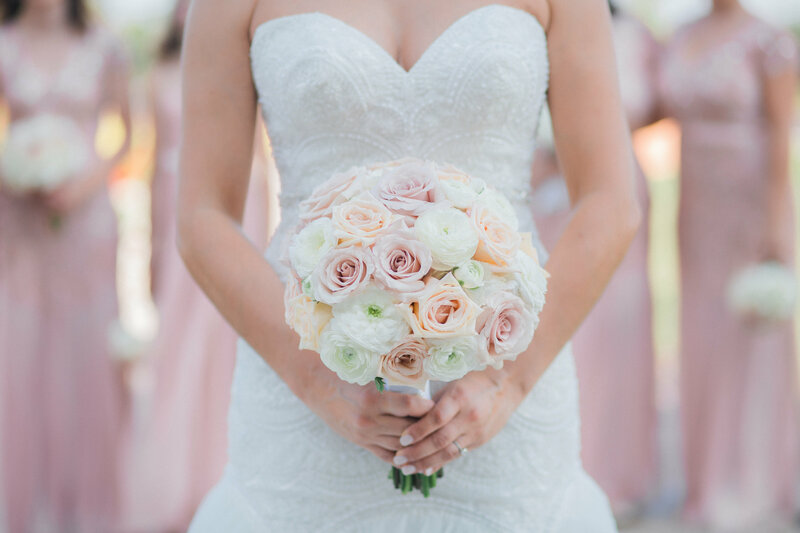 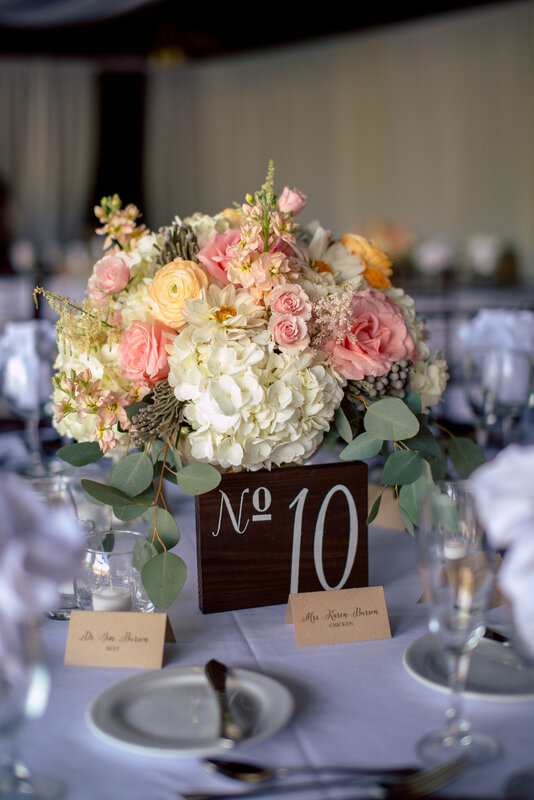 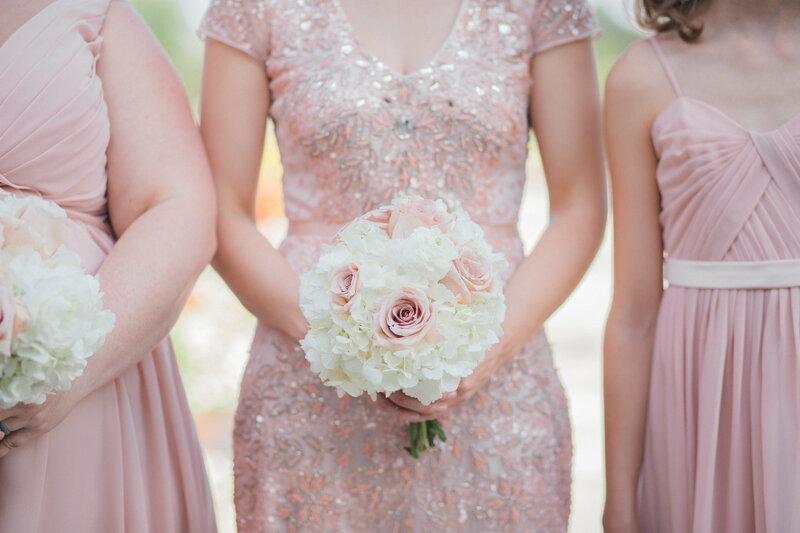 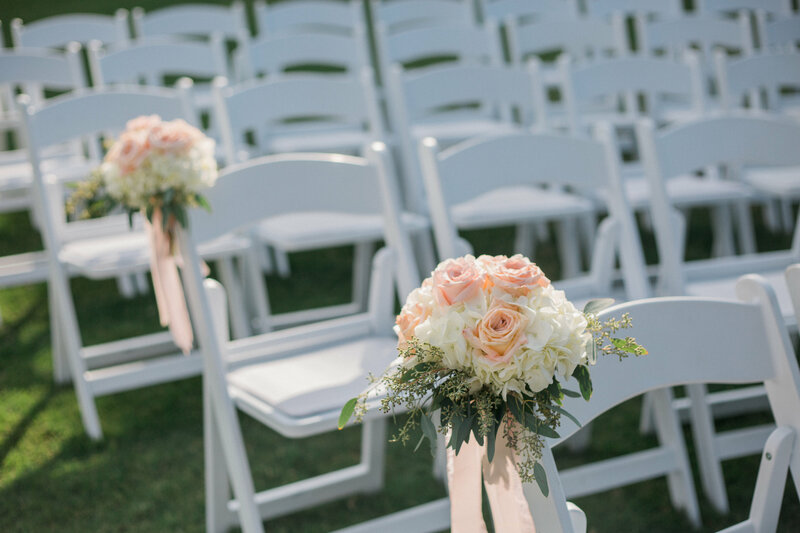 The spray was designed with white hydrangeas, peachy orange roses, peach stock, pink spray roses, light orange ranunculus, peach dahlias, light pink sweet pea and pink astilbe with flowing seeded eucalyptus and ivy. 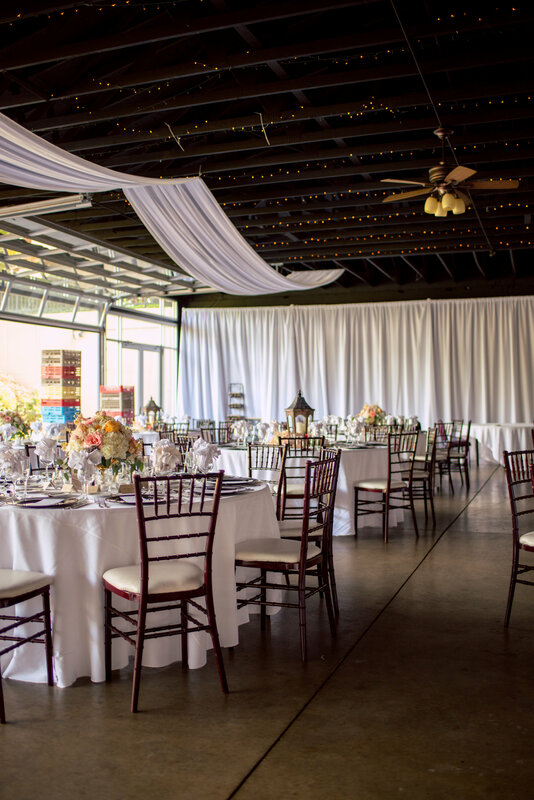 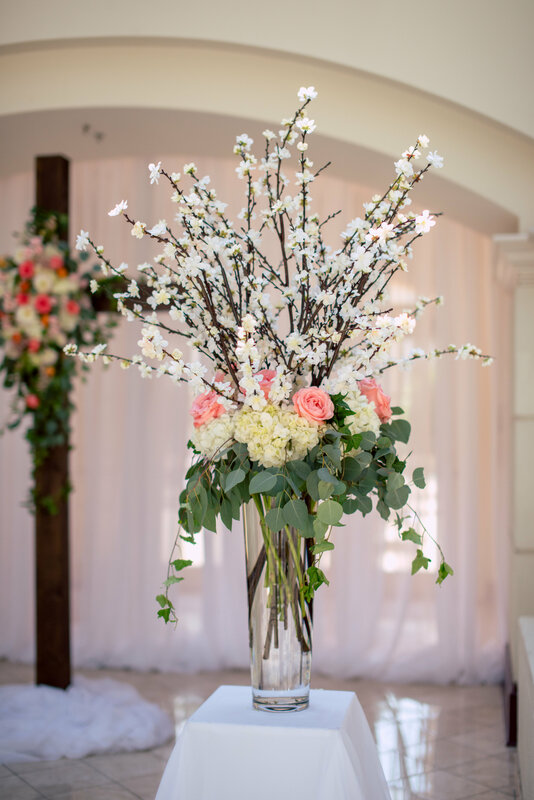 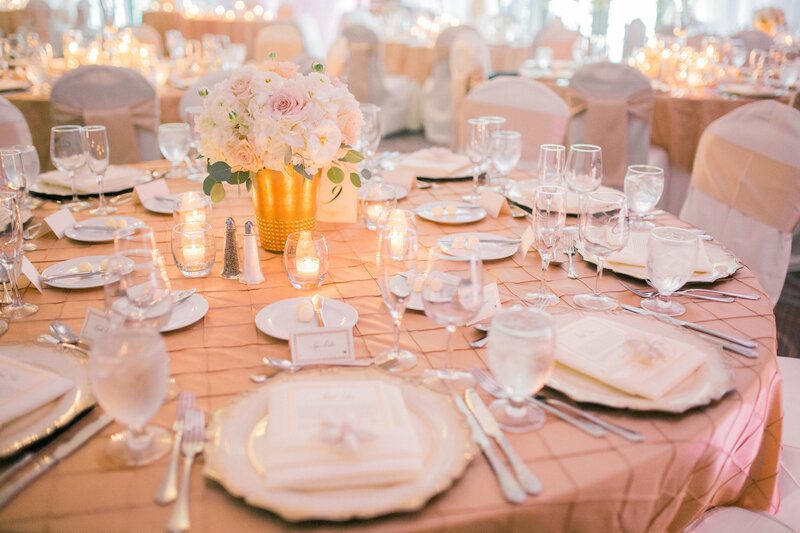 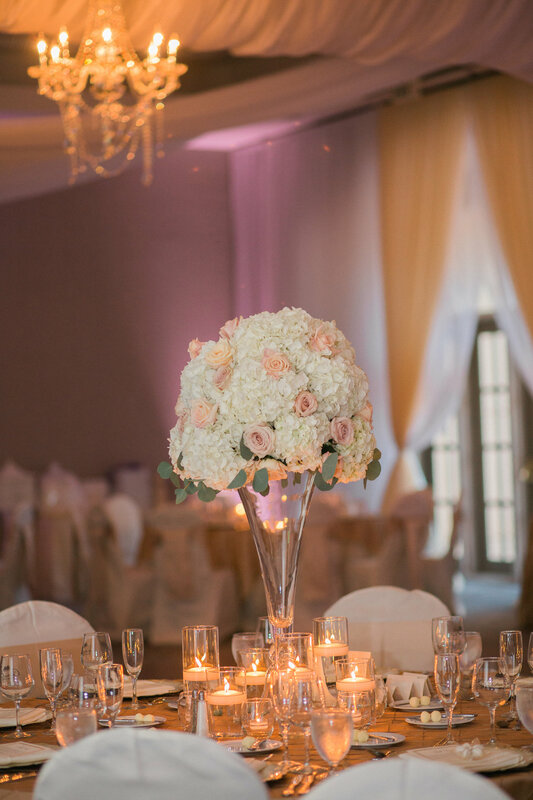 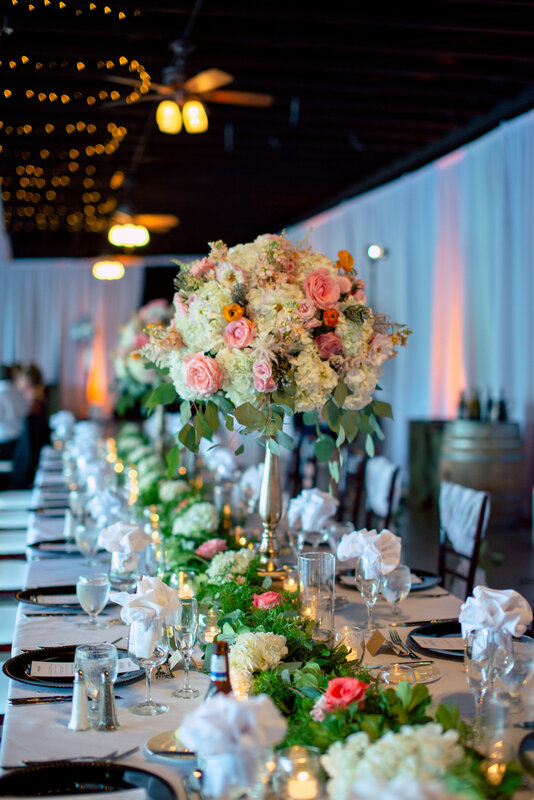 The reception in the Winery Pavillon was also filled with peach, pink and orange floral center piece arrangements with some additional rustic lanterns and our Design House amazing draping. 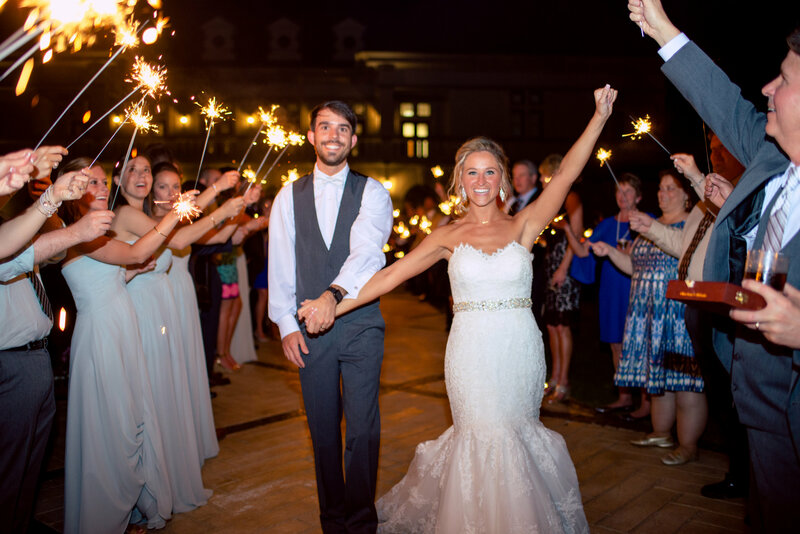 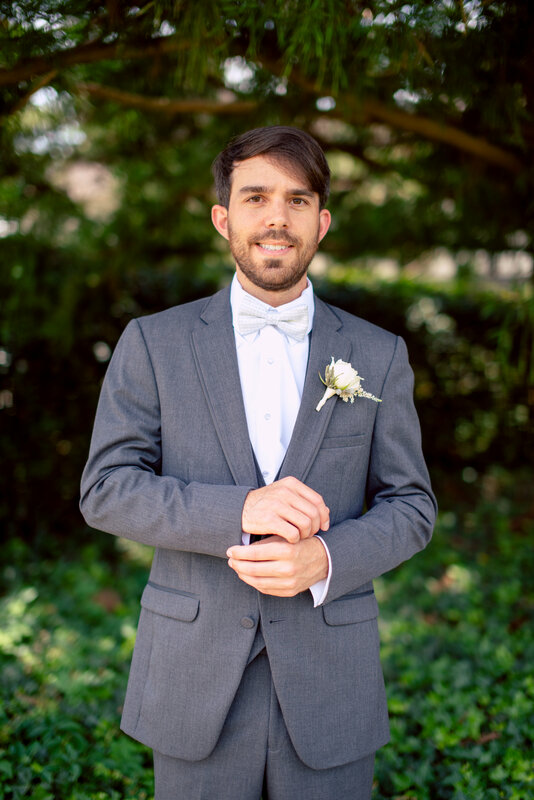 Thank you to Once Like A Spark Photography for these amazing photos!